Which torque applied to a disk with radius 7.0 cm for 3.5 s will produce an angular momentum of 25 N•m•s? This is College Physics Answers with Shaun Dychko. We're going to find the torque that must have been applied to a seven centimeter disk for three and a half seconds producing an angular momentum of 25 Newton meter seconds. We have to assume that the disk began at rest and we know that the angular momentum is the moment of inertia of the disk multiplied by its angular velocity. The final angular velocity will be the initial which we assume is zero, plus the angular acceleration multiplied by time. Then we have torque showing up in our work here when we replace alpha with tau over i because we know that the net torque is moment of inertia multiplied by angular acceleration and so we can solve this for alpha by dividing both sides by i. Then we substitute that in here for alpha, torque over moment of inertia. Then this all gets replaced in place of omega. So we have the angular momentum is moment of inertia multiplied by the torque, divided by moment of inertia multiplied by time. Moments of inertia cancel leaving us with torque multiplied by time, and we can solve for torque by dividing both sides by time. We get that torque is the angular momentum over time. 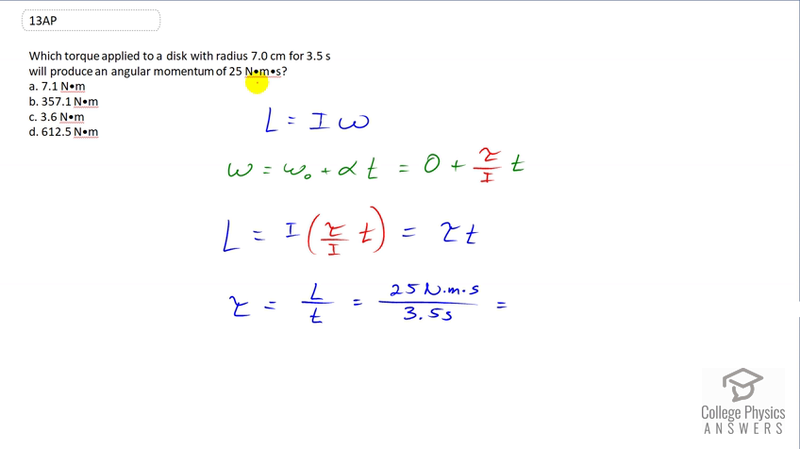 So the angular momentum is 25 and the time if three and half, so 25 divided by three and a half is 7.1. So the answer is A.